How do I use Price Levels? Part I - What are "Price Levels?" Price levels allow you to sell products at different prices based on the customer that is purchasing them. For example, you could create a price level group for "best customers" and when customers in that group log in, they can see their discounted pricing. The most common use for this feature is to setup a wholesale group which allows you to run both your retail and wholesale stores from within 1 store manager. Enter a group name, description, and if necessary set a minimum order amount that a customer in this group must meet before being able to check out. Price Level 1 is the store's standard, retail price. If you are going to be oferring a discount for this group, select anything other than Price Level 1. Make note of the price level you assigned as you will need to update the products with customized pricing for this level in Part III of this guide. The customer group is now created. Now that the group is created, additional options are available. Click on the "Edit" button for the group you just created and you will see the following new options. This basically makes purchases for anyone in this group non-taxable. This setting lets customers register for this type of account by themselves from a registration page on your website. When you enable this option an option for "Auto Approve" will also appear which you can turn on or off. When auto approve is on, customers can register and start using their account right away. Alternately, if this setting is turned off, you will be notified that they registered and must enable the account in order for them to start purchasing. Using the drop down menu, select the customer group you created. Select a product and click its ID, Name or look to the far right and click its "Action ->Edit" button. Using the price levels located on the bottom half of the page, update your product's price levels accordingly. Repeat the same action for every single product in your database. Rather than doing this manually, you can perform a product export, and then import the products back in with the price levels corrected. 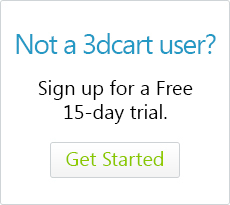 Payment and shipment options on your 3dcart store can be customized based on the customer group that a customer belongs to. It is important to make sure that you have at least 1 shipping and 1 payment option available to the group you created. If you are going to offer the same shipping and payment options for all customer groups, make sure you update all your shipping and payment options to "ALL" in the customer group area of each shipping/payment option.